MARK Morris is a master of light. You see this in all sorts of ways: the deeply satisfying structures where formality is leavened by little quirks and surprises; unassuming costumes that flatter bodies and let you see the dance; and clarity of purpose that means the viewer is in no doubt as to Morris’s intent. There is also light in Morris’s joyfulness, the way he so often uses folk or social dance references that give a sense of a bonded community, and his gorgeous optimism. You come away from Morris and his engaging, good-humoured dancers feeling happy and, yes, light. All of this made Morris’s newest work, Whelm, the wonderful surprise in this Sydney program of four works. Whelm, which premiered in New York only six weeks before its Sydney appearance, dwells in the dark and is strange and mysterious, hinting at conflict and death. Three enigmatic Debussy solo piano pieces propel a quartet in which tight interaction between somberly clad dancers alternates with moments of menace and uncertainty, and the movement switches without notice from flowing balletic turns and leaps to spiky, angular gestures or robotic walks. The pale faces of the dancers stand out spookily from their crepuscular costumes, even that of the woman who is veiled as if in mourning. There are hints of German Expressionist film in jerky movements (I loved the twitches of the lower arm that seem to come out of nowhere) alongside spins and jetes executed at frantic speed. At the piano, Morris’s music director Colin Fowler was pivotal in establishing the spectral mood. The unknown permeates Whelm – the word means to engulf, and not in a good way – and leaves the viewer intrigued and unsettled. A Wooden Tree happily breaks Morris’s no-exceptions provision: what fun is a rule if not broken every now and again? A recorded series of short songs by Scottish songwriter and poet Ivor Cutler covers subjects such as romance, family, friendship and other quotidian stuff, rendered in ditties that combine fun, satire and truth in an apparently artless, even inarticulate, way but in fact are sharply observed and touching. The dances illustrate the songs goofily and were utterly adorable. Mind you, had Guest been alive at the time of A Wooden Tree’s making in 2012 – he died in 2006 at the age of 83 – it wouldn’t have been a surprise had he appeared in person. 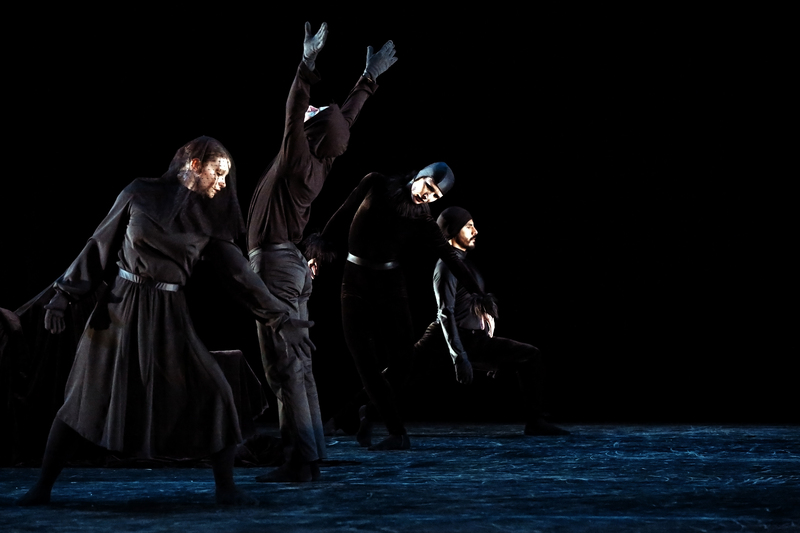 Morris seems to be able to get pretty much anyone he wants, and it’s worth noting that at the New York premiere of A Wooden Tree in 2013 the ensemble of eight dancers included none other than Mikhail Baryshnikov, who has worked much with Morris. A Wooden Tree and Whelm were bookended by the sunny warmth of Pacific and Festival Dance, the first performed to two movements from a Lou Harrison piano trio and the second to a trio by Johann Nepomuk Hummel (Morris has wide musical interests). Both were bracingly played by Fowler, violinist Georgy Valtchev and cellist Andrew Janss. Pacific was created in 1996 for San Francisco Ballet and the women danced on pointe. The Mark Morris Dance Group version, premiered in February this year, has everyone in soft shoes, a fact that aligns the men and women more closely and perhaps flattens it out a little. Nine dancers, wearing long floaty skirts in shades of green, blue and orange, sweep in and out in swiftly changing permutations and striking arm and upper-body shapes that evoke ocean and sky, not in specifics but in strong, harmonious and serene atmospherics. Festival Dance (2011) is an uplifting, generously scaled romance – an ode to dance itself if you will – with six couples whizzing about in the highest of spirits. MMDG has visited Australia only three times before, for the 1994 Adelaide Festival, to Sydney in 2003 and for this year’s Perth International Arts Festival. This was, in other words, a rare chance to see the work of this living master. Would it have been more powerful to see one of the full-length works? Yes. But any opportunity to see Morris must be seized without reservation. A version of this review appeared in The Australian on June 5.